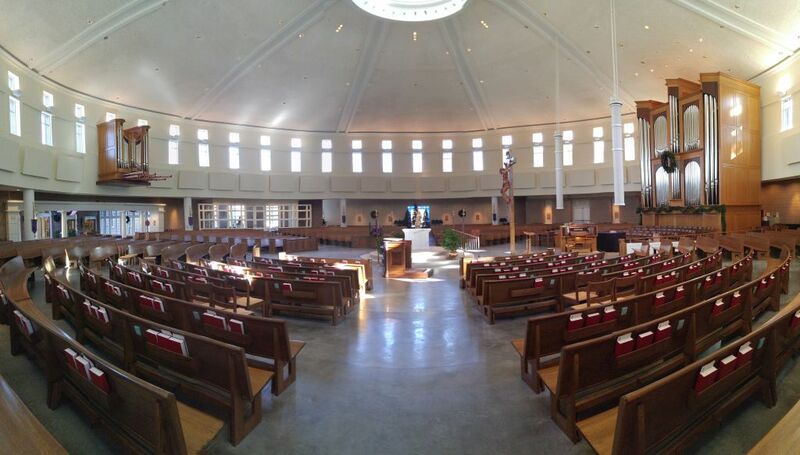 The organ at St. Bede Catholic Church is the result of eight years of planning and dreaming, hoping and praying. St. Bede Parish’s communicant strength is about 3,000 families, formerly located in a small landlocked building close to Colonial Williamsburg. The former site simply could not accommodate the parish’s phenomenal growth, nor could the entire parish worship together. When planning the new building, St. Bede’s Pastor, the Rev. Monsignor William Carr, insisted that the new church include a pipe organ, and that the organbuilder be commissioned to work with the architect from the beginning. The new building designed by architect Tom Kerns, seats 1,500, and is expandable to seat 2,000. The then Music Director, and later consultant for the project, Steve Blackstock, formed a Musical Instruments Committee to select the organbuilder, as well as other musical instruments for purchase. The Musical Instruments Committee directly communicated with the Parish’s building committee (called the Core Committee) as the new building was planned, to make sure that the organ’s requirements were supported throughout the process. The organ has a full set of inter and intra-divisional couplers. Even though this church is not located in the Colonial District, there was great concern on the part of the Core Committee that the building relate to the area’s Georgian architecture—no small feat for a big round room—and that, since the organ case would be the significant visual element in the Church, it must reflect appropriate features of Georgian design. A great emphasis was placed on the importance of art and music as direct participants in liturgical expression, and the organ had to appeal to all the senses in this surprisingly intimate—although rather large—space. 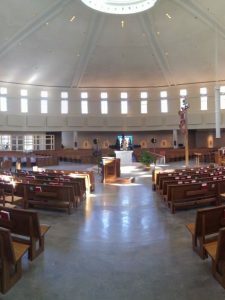 As the building’s design process unfolded, and the cost estimates exceeded projections, significant “value engineering” of the building was undertaken to allow the Church to be built. The organ project was shelved and its estimated cost applied toward the building. It became apparent that an organ, whenever it would be installed, would need a small antiphonal division at the opposite end of the Church to assist in congregational singing, due to a change in building materials. Certain stops in the organ were prepared for future addition, to lower the initial price. The music personnel changed, and the parish concentrated upon building the Church. 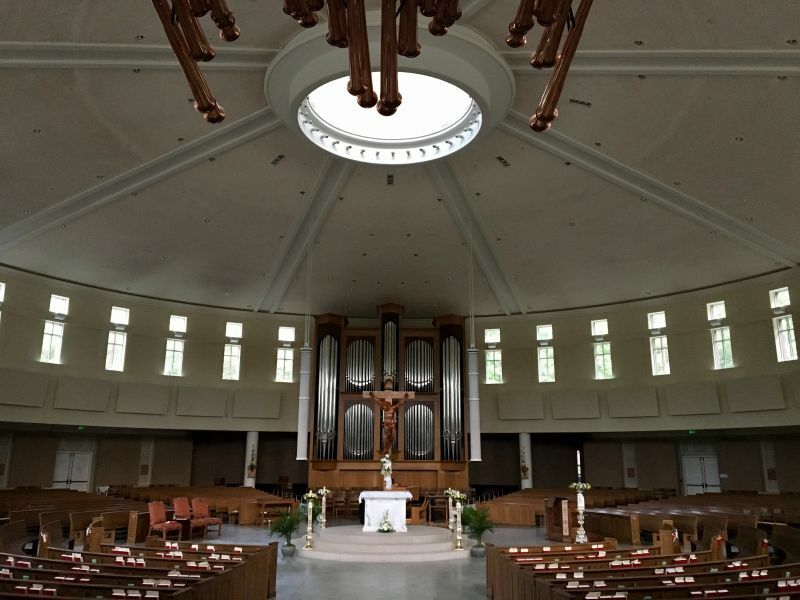 Once the building was up, Monsignor Carr’s vision and passion for building the new pipe organ was re-kindled. His love of fine art and artistic liturgical expression is infectious. 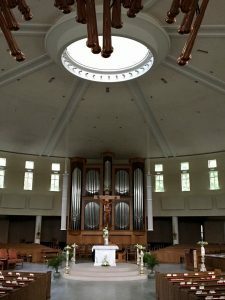 It was through his inner fire that he established the notion in the minds of the parishioners that the Church was simply not finished until the pipe organ was installed. Although at the time the Church did not have an organist, our contract was signed the week following the new building’s dedication. 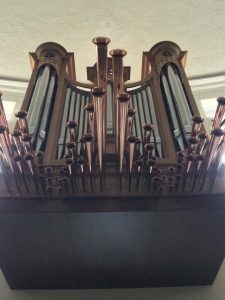 As the organ’s installation date approached, the parish hired organist Neil Kraft of Ohio to be their new Director of Music. He has already established himself in the Tidewater Area as a musician of high caliber, and the perfect person to develop an inclusive parochial music program, with the organ as the principal musical instrument. A concert series to celebrate the dedication of this new instrument is being organized. The opening recital will be played by Erik Wm. Suter on Sunday, September 30th, and John Scott will play in June of 2006. The Church is working on sponsorship of a concert featuring the Virginia Symphony, but this is currently in the planning stage. The new Pastor, the Rev. John Abe, is committed to making St. Bede known for beautiful music, both in liturgical and concert contexts, for Williamsburg and the greater Tidewater Area. 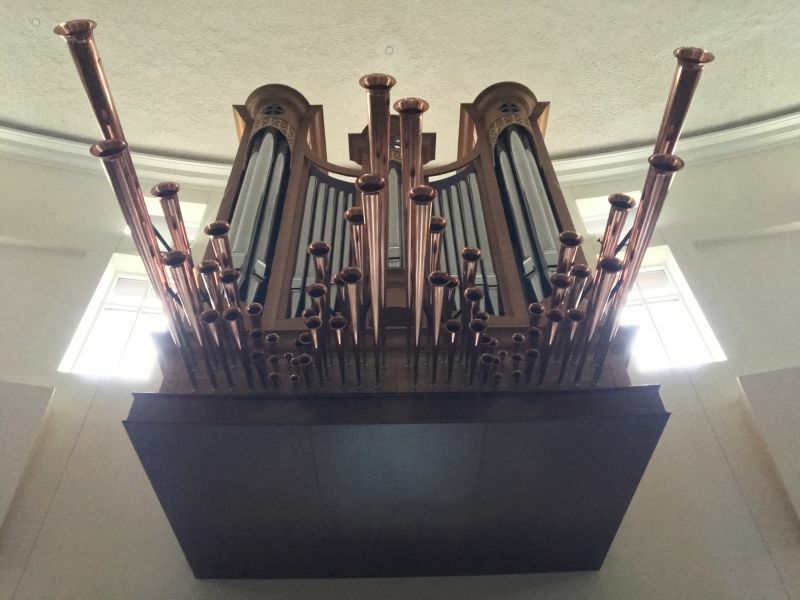 The organ case stands three stories tall and is made of 1 1/2″ thick solid white oak and white oak veneers. Walnut is used for the pipe shades and accenting trim details. This is truly heroic cabinet making! The facades incorporate pipes of the Great 16′ Double Open Diapason (the low 20 notes of which are shared in the pedal), the Great First and Second 8′ Open Diapasons, and the Pedal 8′ Principal. The 16′ Pedal First Open Diapason of wood stands behind the organ case and is stained and finished in a dark walnut color. Resonators of the low octaves of the pedal 32′ & 16′ Trombones are made of beautiful, clear pine, continuing upscale in thick 52% tin pipe metal as this stop becomes the manual Trombas, voiced on 7″ wind. The big Tuba stands vertically in the Choir box just behind the shutters, and is certainly the Trombas’ big brother, being voiced on nearly 30″ pressure! The Procession Organ’s case is also of white oak, to match the Main Organ case. Its pipe shades are carved basswood. Celtic crosses have been cut into the tower tops and are enameled in rich, dark purple, and outlined in gold leaf. When played with the Main Organ, the Processional Organ’s two Principal stops have the effect of “pulling” the sound out of the Main Organ’s case, and surrounding the listeners with an incredibly inescapable, voluptuous tone. 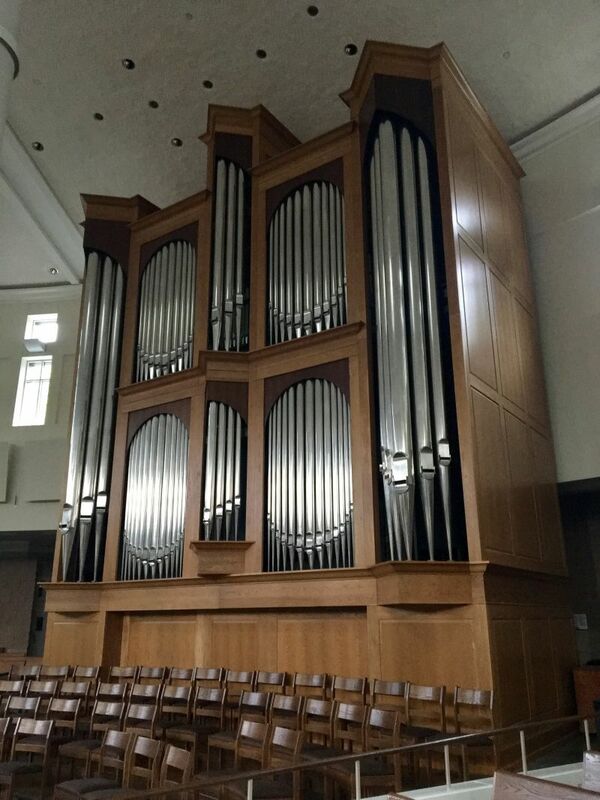 The console of 1 1/2″ thick white oak is attached to an easily moved platform And, it’s a good thing, because the organ is heard in its best balance starting about 15 feet away from the case. We utilize AGO radiating, concave pedalboards for their superior ergonometry. 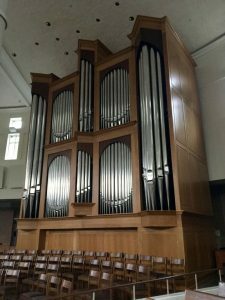 In a modern, eclectic pipe organ, the pedalboard’s shape should not limit an organist’s ability to play in styles other than that which a flat pedalboard constrains. Those of you who have followed our work know that our instruments are liturgical organs that play literature remarkably well. Our style is in direct response to the need for an organ to function liturgically and musically, but not at the expense of a particular historical, national, or idiosyncratic musical style. Only a classic concept of organbuilding can truly accomplish this, and I think only an organist trained organbuilder has the ability to empathize with modern American musical requirements, reconcile these to classic organbuilding practices, and know how to achieve the intended results. Slider wind chests keep the tonal design physically honest, and offer speech, voicing, and tuning advantages (as well as virtually no long-term maintenance). Our proprietary Slider Pedal Chest allows us to play a single rank of pedal pipes at several pitches – without giving up slider chest speech, tuning stability, and repetition characteristics. Because they’re pedal stops, and usually only one note is played at a time, we can scale these individual ranks to be appropriate for two or three tonal contexts and save the client some money. Although we were one of the first American organbuilders to re-introduce the Tuba into modern practice, in 1991 at the Chapel of St. John the Divine, our tonal innovations are often of a subtler (and quieter) nature. For example, in this organ we have specially developed Dolcan-shaped pipes for the metal top octaves of open wood ranks; they sound like wood pipes, but stay in tune. We have perfected Walter Holtkamp’s Ludwigtone as our Flute Colestis, its plaintive and gentle celesting tone evocative of something Heavenly, which explains the pun in the nomenclature. We have refined the 18th century French Flûte à Bibéron (“Baby-Bottle Flute”) to be a colorful chimney flute tone suitable for solos, the foundation of a flute chorus, or secondary foundation for a principal chorus. The sound of the organ is warm and rich, filling the space nicely with a generous foundation. Each chorus has its own distinctive color, so there is no redundancy within each family of sound. The organist will be able to lead congregational singing with a wide variety of color, at many different volume levels. And, recitalists won’t be disappointed in the tonal resources, and the informed manner of their disposition and execution. Everyone seems to have found “favorite” stops in this instrument. Of course the Pontifical Trumpets titillate the eye and ear, and most visitors want to hear them right off the bat. However, my 16 year-old son Stephen, already an organist of greater accomplishment than his father, fell in love with the Choir 8′ English Open Diapason while preparing a recital for the Tidewater POE held last June. “It has something to tell you,” he says. What higher compliment can an organbuilder receive? After all, shouldn’t pipe organs have a strong emotional appeal, so that when played they grab you and don’t let go? Henry Willis once said that truly great organs are only created when 90% of the project’s effort is expended upon the last 2% of perfection. After the organ is built, installed, and voiced, it’s that last step of careful, time-consuming, painstaking tonal finishing that imparts a living soul into the instrument. That you feel “connected” while listening or playing is no happy accident, but the result of careful listening, and exacting craftsmanship on the part of the voicer working on the pipes. It is only when one is working at this level that organbuilding is truly an art. And, it is only when clients have the sensitivity and sensibility to know the difference that truly world-class pipe organs are commissioned. It has been a tremendous honor to build this instrument, and to work with Father Abe, Monsignor Carr, Steve Blackstock, Neil Kraft, and the wonderful people at St. Bede’s Church. We look forward to many years of wonderful music-making and musically inspired liturgies at St. Bede’s.